Does the comical gullibility of the Western public have any bounds? Disregarding all the previous false alarms and thoroughly debunked psyop false flag operations designed to pin genocidal misconduct on the Syrian government of President Bashar al-Asad in order to produce a rationale for full scale intervention in Syria, the Western propaganda machine is now being reactivated, hoping to finally score where previously it had failed miserably. East Ghouta (2013), Aleppo (2016), Khan Sheikhun (2017), and now a resuscitated East Ghouta with the tedious “Assad killing his own people” narrative all over again — perhaps in this case the fourth time’s a charm, in Syria at least. After all, given the Western audience’s known attention span, the phony 2013 East Ghouta genocidal episode must by now appear pre-historical, so isn’t it about time to revisit the same location and give it another try? It just might work this time around. In order not to be unfairly accused of originality in churning out war-escalation propaganda, the following day, February 23, the Guardian reiterated its by now forgotten Aleppo allegations of slightly over a year ago, but now recast to fit the new East Ghouta scenario: “Medical crisis in east Ghouta as hospitals ‘systematically targeted'”. The utter contempt with which Western propaganda mavens regard their zombified audience, its capacity to connect the dots, and even ability to recall the most recent events, is best illustrated by juxtaposing the current “Srebrenica in East Ghouta” cant to mirror image Aleppo drivel that was broadcast not long ago, in late 2016. As the Syrian Army was closing in on the terrorist stronghold of East Aleppo, and in the wake of the unsuccessful December 5 2016 Security Council Aleppo Resolution designed to stop its advance, which failed due to Russian and Chinese vetoes, just as now, as if on cue, the Western propaganda machinery moved into high gear with the same familiar and ominous rhetoric pointing unmistakably at Srebrenica. 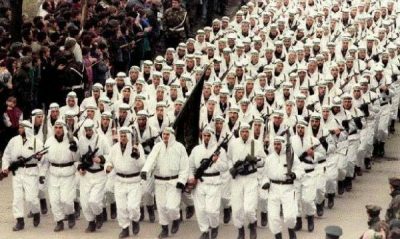 Without any direct, verifiable evidence from the field whatsoever, just as with East Ghouta today, and reenacting uncreatively the threadbare Srebrenica scenario of 1995, Western government and media sources in 2016 began asserting in unison that Syrian authorities in Aleppo were arresting “hundreds of men and boys,” a standard Srebrenica meme for those who are familiar with the subject. Predictably, and also following the Srebrenica template, the abducted “men and boys” were allegedly disappearing in unknown directions. Dissemination of similar Srebrenica-evoking imagery may confidently be expected in the coming days as the Syrian Army proceeds to clear East Ghouta of its terrorist occupiers. The “debate” staged in the British parliament on December 13 2016 was very likely conceived in order to solidify the psychologically prepared public opinion behind the “humanitarian intervention” option in Syria, whenever the signal was given. The current East Ghouta hype has exactly the same purpose, and we should watch for attempts soon to pass high sounding parliamentary resolutions asserting the Srebrenica-anchored “R2P” (Right to protect) rationale. In December 2016 the Aleppo intervention R2P scenario fizzled out when the Syrian Army swiftly defeated the terrorists in time to enable the people of Aleppo to celebrate a joyous Christmas holiday. Hopefully, the people of East Ghouta will soon be delivered with equal speed from their five-year nightmare in the clutches of Western-backed terrorists on Damascus’ doorstep.